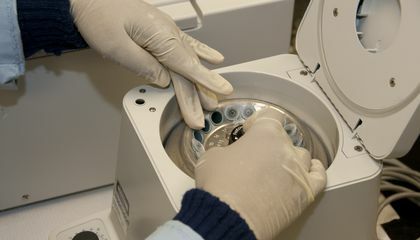 One of the most basic and necessary pieces of equipment in medical labs is a centrifuge. Often bulky and expensive, this device (in the most simple terms) spins things. And spinning things like blood can separate out its components. It allows doctors to diagnose diseases like malaria. But the lack of electricity and resources in rural regions around the world means no centrifuge. Now, a simple new 20-cent gadget could change all that. It's based on an unusual source of inspiration: the whirligig. "There are more than a billion people around the world who have no infrastructure. No roads. No electricity," says Manu Prakash. He is a physical biologist at Stanford and inventor of the new gadget. When he visited Uganda in 2013 he found that clinics either did not have centrifuges or didn't have the juice to power them. "One clinic used its broken centrifuge as a doorstop," Prakash tells Devin Powell at Nature. "I realized that if we wanted to solve a critical problem like malaria diagnosis, we needed to design a human-powered centrifuge that costs less than a cup of coffee," Prakash says in a press release. 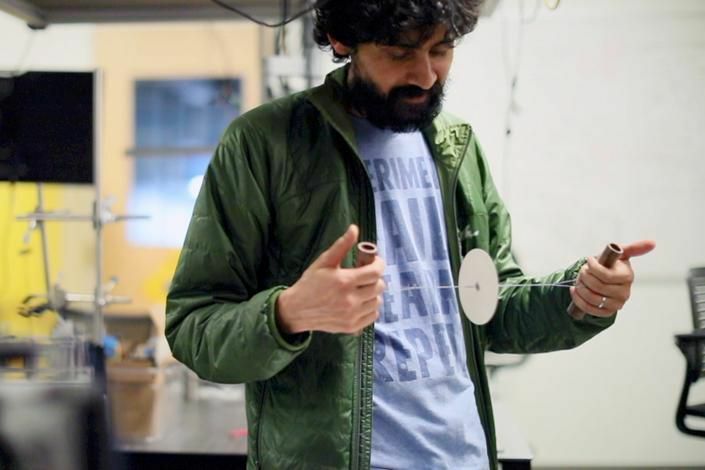 When he returned to Stanford, Prakash began brainstorming ideas with one of his post-docs, Saad Bhamla, examining at all sorts of spinning things, reports Madeline K. Sofia at NPR. They quickly began focusing on old-school, preindustrial toys like yo-yos and whirligigs. "One night I was playing with a button and string. And out of curiosity, I set up a high-speed camera to see how fast a button whirligig would spin. I couldn't believe my eyes," Bhamla says in the press release. The button was rotating at 10,000 to 15,000 rpms. The pair began prototyping small hand-powered centrifuges based on the whirligig principle. Their final model was the Paperfuge. It spins at 125,000 rpm, the equivalent of a centrifuge costing $1,000 to $5,000, according to the press release. The Paperfuge is made of a disk of paper coated in a polymer, reports Sofia. The disk is attached to two pieces of wood or PVC pipe via string. When the strings are pulled, the disc in the middle spins. This acts as a centrifuge for a blood sample attached to the center of the disk. The team describes their work in the journal Nature Biomedical Engineering. Prakash and Bhamla recently returned from successful field trials of the Paperfuge in Madagascar where they used it to test for malaria. While the gadget only takes two minutes to separate blood, reports The Economist, it takes 15 minutes of whirligigging for malaria-diagnosing separations. Once the blood is separated, however, it needs to be examined by a microscope. Luckily, several years ago Prakash also created the Foldscope. It is a $1 paper microscope with optical quality similar to conventional microscopes that will begin distribution in 2018. What do kayakers and river snails have in common? How can a microscope only cost $1? This could help them because it can let them live longer, but it still can have malfunctions and can kill people. Because it has the same quality as the new model coming out in 2018. The materials that are used to make the the microscope can be the cause of one dollar. I think that this is a great idea for countries that don't have enough money to buy real microscope. It only cost 1$ because it is made out of paper. A microscope can cost one dollar by the materials used. This article is good because it helps the reader understand how microscopes can help countries. Prakash made it easy by making a microscope that only cost a dollar from just using cheap materials, that would make it easier to sell and more people could afford it because of how cheap it is to make the spinner. It depends on the material its made out of. I think it's really cool that this guy saw that there was a problem with testing for Malaria in undeveloped countries and not only did he find a way to test it using human-power, but he also found a way that had a very low cost so it was easy to get.